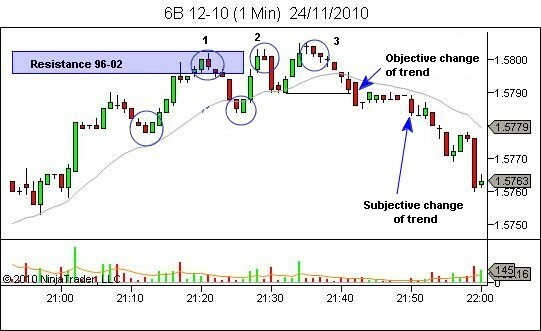 The following chart sequence shows a great example of how I define a change of trend. The chart is a 1-minute chart of the 6B. The market and timeframe are irrelevant though. The concept applies to all markets and whichever timeframe you’re using to define the trend. I just happen to currently use the 1-minute chart. As a background to the price action we see price in an uptrend leading into a resistance area between 1.5796 and 1.5802. Momentum clearly slows as price makes three failed attempts to breach the area (1 x test of resistance and 2 x breakout failures), before finally breaking the swing low between breakout attempts 2 and 3. I call this break of the swing low the “objective” change of trend. “Objective” refers to the fact that there is no discretion involved. Price traded below the swing low – there is no doubt. However, for me, a change of objective trend definition does NOT mean a change of trend. Price acceptance means seeing evidence of price continuing to trade beyond the point at which the objective trend definition changed. 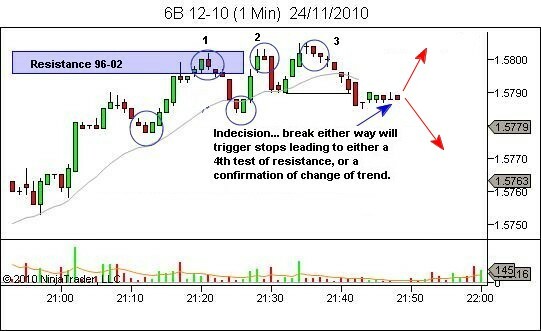 In this example, that would be continuation lower. A reversal straight back through the point of objective trend definition implies a rejection of the potential trend change (and usually a beautiful trade opportunity back in the original trend direction). This is an interesting example. As shown below, price stalls immediately following the objective change of trend as both bulls and bears find some balance. From this point, a break higher would reject the objective trend change, leading to continuation higher for a fourth test of resistance. The uptrend would remain in force. A break down will demonstrate price acceptance, confirming our “subjective” change of trend. The trend would then be considered down. As seen below, a break downwards occurred from the area of price stall, confirming our change of trend. Thanks Lance, it was really helpful! really this article will change my thought about how I determine change in the trend. 1) would you please mentioned in the above chart what is the high probability trades , and what is the low probability trade that you can select during your trading. 2) if I decide to take short entry at points 2 or 3 due to weakness trend at resistance level is this consider good trades from your point of view? 3) do you agree with me that the best level to determine the subjective change in the above trend is the swing low at 21:10 because it make higher high and close above the last swing high , In contrast with the swing low you have mentioned that just make higher high without clear close? 1) “Higher probablity” and “lower probability” are somewhat subjective terms. We make an assessment based upon market context and our assessment of strength and weakness. So my thoughts may differ from your thoughts. And that’s absolutely fine. a. Trades in the with-trend direction are generally a higher probability than those counter-trend. b. Trades aligned with strength or against weakness are generally a higher probability than those which are not as well aligned. c. Traps such as occur with a BOF are higher probability than TST (which don’t have the additional trap orderflow). So I kind of like all the marked trade locations. But of the two pullback longs, I prefer the first. The second pulls back on increased strength. So it’s lower probability than the first. And the BOF trades (2 & 3) are higher probability than the TST (1). As I said though, all are acceptable. And thoughts of “higher vs lower probability are all rather subjective anyway. 2) As above, I prefer 2 and 3 over 1. They’re good trades. 3) No. This is different to how I define the trend. If you wish to define it in this way, it’s fine. It just won’t be as quick to recognise a change of trend. Lance, how does this fit in with taking trades at the edge of structure? 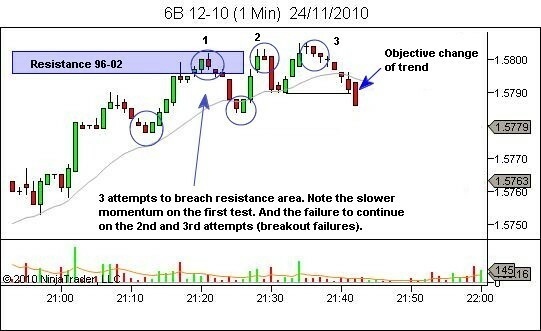 What do you do if by the time trend changes, we are somewhere in the middle of our structure and not at the edge? Hi Jay, this is nothing to do with taking trades at the edge of structure. This is related to trend definitions, in particular the point of transition from one trend to another. I’m not saying we take a trade right on the point of trend change. I’m just pointing out when the definition has changed. Then… let the new structure develop and trade that.